Anyone seriously interested in global warming needs to learn about the ‘ice ages’, or more technically ‘glacial periods’. After all, these are some of the most prominent natural variations in the Earth’s temperature. And they’re rather mysterious. They could be caused by changes in the Earth’s orbit called Milankovich cycles… but the evidence is not completely compelling. I want to talk about that. But to understand ice ages, the first thing we need to know is that the Earth hasn’t always had them! The Earth’s climate has been cooling and becoming more erratic for the last 35 million years, with full-blown glacial periods kicking in only about 1.8 million years ago. Of course you should have lots of questions about how this graph was made, and how well we really know these ancient temperatures! But for now I’m just giving a quick overview—click on the graphs for more. In future weeks I should delve into more technical details. The Paleocene began with a bang, as an asteroid 10 kilometers across hit the Gulf of Mexico in an explosion two million times larger than the biggest nuclear weapon ever detonated. A megatsunami thousands of meters high ripped across the Atlantic, and molten quartz hurled high into the atmosphere ignited wildfires over the whole planet. A day to remember, for sure. 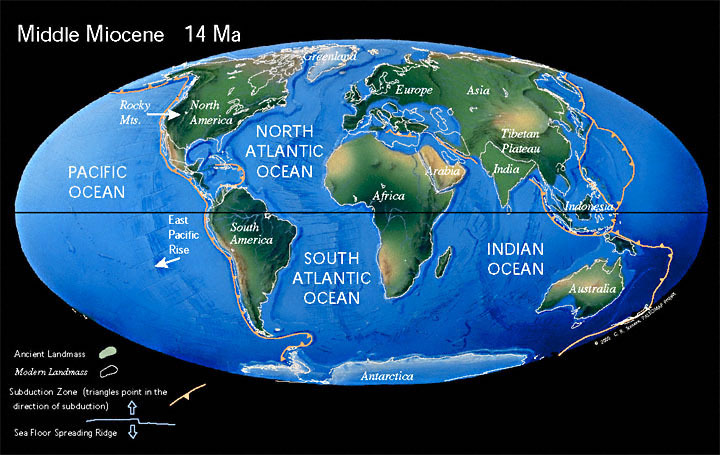 The Paleocene started out hot: the ocean was 10° to 15° Celsius warmer than today. Then it got even hotter! 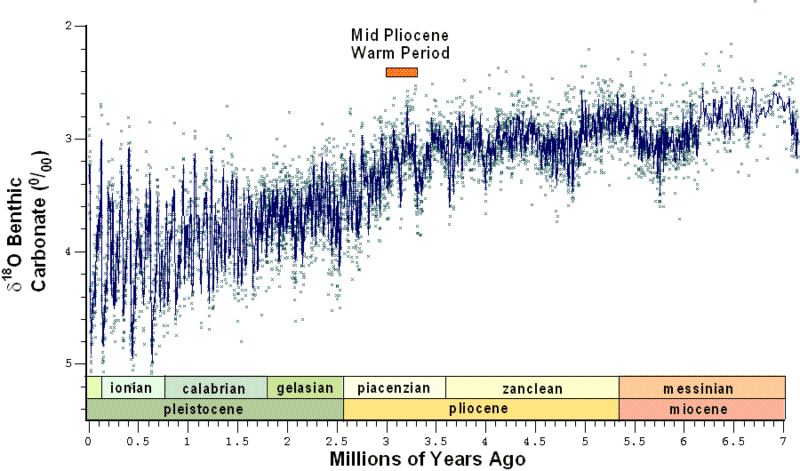 Besides a gradual temperature rise, at the very end of this epoch there was a drastic incident called the Paleocene-Eocene Thermal Maximum— that’s the spike labelled "PETM". Ocean surface temperatures worldwide shot up by 5-8°C for a few thousand years—but in the Arctic, it heated up even more, to a balmy 23°C. This caused a severe dieoff of little ocean critters called foraminifera, and a drastic change of the dominant mammal species. What caused it? That’s a good question, but right now I’m just giving you a quick tour. 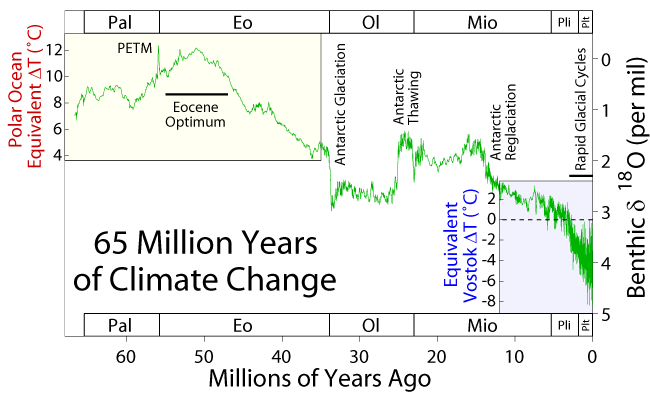 During the Eocene, temperatures continued to rise until the so-called ‘Eocene Optimum’, about halfway through. Even at the start, the continents were close to where they are now—but the average annual temperature in arctic Canada and Siberia was a balmy 18 °C. The dominant plants up there were palm trees and cycads. Fossil monitor lizards (sort of like alligators) dating back to this era have been found in Svalbard, an island north of Greenland that’s now covered with ice all year. Antarctica was home to cool temperate forests, including beech trees and ferns. In particular, our Earth had no permanent polar ice caps! 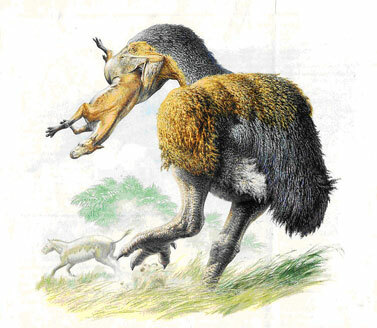 Diatryma, the 8-foot tall "terror bird", with a fearsome beak! But it’s not as huge as it looks here, because horses were only half a meter high back then! • Donald R. Prothero, The Eocene-Oligocene Transition: Paradise Lost, Critical Moments in Paleobiology and Earth History Series, Columbia University Press, New York, 1994. As the Eocene drew to a close, temperatures began to drop. And at the start of the Oligocene, they plummeted! Glaciers started forming in Antarctica. 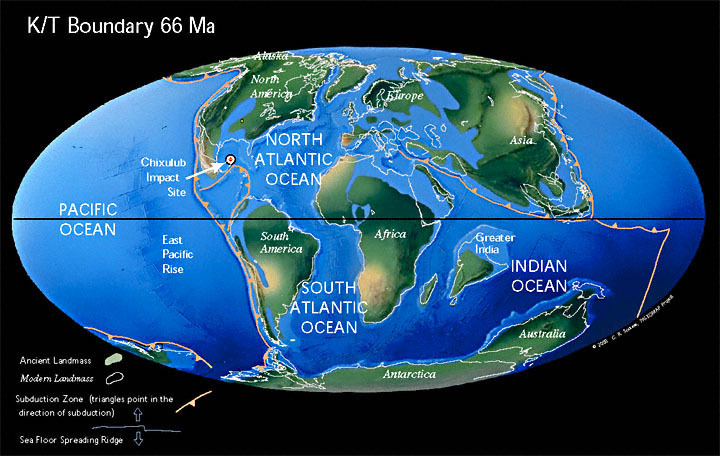 The growth of ice sheets led to a dropping of the sea level. Tropical jungles gave ground to cooler woodlands. What caused this? That’s another good question. Some seek the answer in plate tectonics. 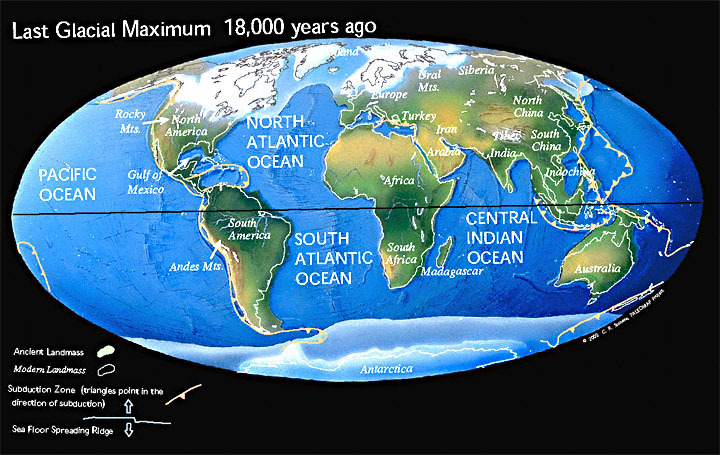 The Oligocene is when India collided with Asia, throwing up the Himalayas and the vast Tibetan plateau. Some argue this led to a significant change in global weather patterns. But this is also the time when Australia and South America finally separated from Antarctica. Some argue that the formation of an ocean completely surrounding Antarctica led to the cooling weather patterns. After all, that lets cold water go round and round Antarctica without ever being driven up towards the equator. Near the end of the Oligocene temperatures shot up again and the Antarctic thawed. Then it cooled, then it warmed again… but by the middle of the Miocene, temperatures began to drop more seriously, and glaciers again formed on the Antarctic. It’s been frozen ever since. Why all these temperature fluctuations? That’s another good question. The Miocene is when grasslands first became common. It’s sort of amazing that something we take so much for granted—grass—can be so new! But grasslands, as opposed to thicker forests and jungles, are characteristic of cooler climates. And as Nigel Calder has suggested, grasslands were crucial to the development of humans! Early hominids lived on the border between forests and grasslands. That has a lot to do with why we stand on our hind legs and have hands rather than paws. Much later, the agricultural revolution relied heavily on grasses like wheat, rice, corn, sorghum, rye, and millet. As we ate more of these plants, we drastically transformed them by breeding, and removed forests to grow more grasses. In return, the grasses drastically transformed us: the ability to stockpile surplus grains ended our hunter-gatherer lifestyle and gave rise to cities, kingdoms, and slave labor. So, you could say we coevolved with grasses! Starting around the Pliocene, the Earth’s temperature has been getting every more jittery as it cools. Something is making the temperature unstable! And these fluctuations are not just getting more severe—they’re also lasting longer. These temperature fluctuations are far from being neatly periodic, despite the optimistic labels on the above graph saying “41 kiloyear cycle” and “100 kiloyear cycle”. 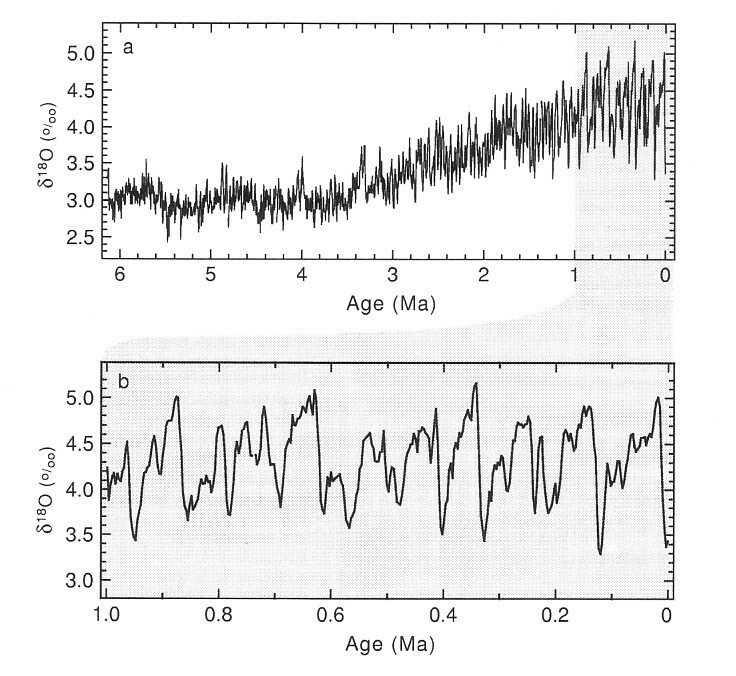 And beware: the data in the above graph was manipulated so it would synchronize with the Milankovitch cycles! Is that really justified? Do these cycles really cause the changes in the Earth’s climate? More good questions. You can tell this graph was made by a real paleontologist, because they like to put the present on the left instead of on the right. And maybe you’re getting curious about this “δ18O benthic carbonate” business? Well, we can’t directly measure the temperatures long ago by sticking a thermometer into an ancient rock! We need to use ‘climate proxies’: things we can measure now, that we believe are correlated to features of the climate long ago. δ18O is the change in the amount of oxygen-18 (a less common, heavier isotope of oxygen) in carbonate deposits dug up from ancient ocean sediments. These deposits were made by foraminifera and other tiny ocean critters. The amount of oxygen-18 in these deposits is used as temperature proxy: the more of it there is, the colder we think it was. Why? That’s another good question. As you can see here, the third-to-last glacial ended about 380,000 years ago. In the warm period that followed, the first signs of Homo neanderthalensis appear about 350,000 years ago, and the first Homo sapiens about 250,000 years ago. Then, 200,000 years ago, came the second-to-last glacial period: the Wolstonian. This lasted until about 130,000 years ago. Then came a warm period called the Eemian, which lasted until about 110,000 years ago. During the Eemian, Neanderthalers hunted rhinos in Switzerland! It was a bit warmer then that it is now, and sea levels may have been about 4-6 meters higher—worth thinking about, if you’re interested in the effects of global warming. The last glacial period started around 110,000 years ago. This is called the Winsconsinan or Würm period, depending on location… but let’s just call it the last glacial period. A lot happened during the last glacial period. Homo sapiens reached the Middle East 100,000 years ago, and arrived in central Asia 50 thousand years ago. The Neanderthalers died out in Asia around that time. They died out in Europe 35 thousand years ago, about when Homo sapiens got there. Anyone notice a pattern? The oldest cave paintings are 32 thousand years old, and the oldest known calendars and flutes also date back to about this time. It’s striking how many radical innovations go back to about this time. The glaciers reached their maximum extent around 26 to 18 thousand years ago. There were ice sheets down to the Great Lakes in America, and covering the British Isles, Scandinavia, and northern Germany. Much of Europe was tundra. And so much water was locked up in ice that the sea level was 120 meters lower than it is today! Then things started to warm up. About 18 thousand years ago, Homo sapiens arrived in America. In Eurasia, people started cultivating plants and herding of animals around this time. There was, however, a shocking setback 12,700 years ago: the Younger Dryas episode, a cold period lasting about 1,300 years. We talked about this in “week304”, so I won’t go into it again here. The Younger Dryas ended about 11,500 years ago. The last glacial period, and with it the Pleistocene, officially ended 10,000 years ago. Or more precisely: 10,000 BP. Whenever I’ve been saying ‘years ago’, I really mean ‘Before Present’, where the ‘present’, you’ll be amused to learn, is officially set in 1950. Of course the precise definition of ‘the present’ doesn’t matter much for very ancient events, but it would be annoying if a thousand years from now we had to revise all the textbooks to say the Pleistocene ended 11,000 years ago. It’ll still be 10,000 BP. As far as geology goes, the Holocene is a rather silly epoch, not like the rest. It’s just a name for the time since the last ice age ended. In the long run it’ll probably be called the Early Anthropocene, since it marks the start of truly massive impacts of Homo sapiens on the biosphere. We may have started killing off species in the late Pleistocene, but now we’re killing more—and changing the climate, perhaps even postponing the next glacial period. • Why was it so hot in the early Eocene? 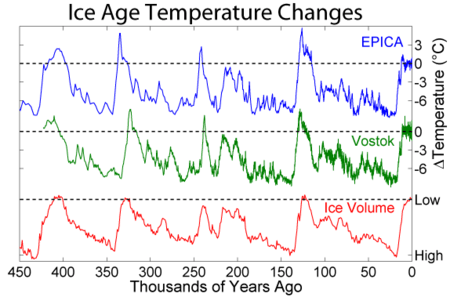 • Why has it generally been cooling down ever since the Eocene? • Why have temperature fluctuations been growing since the Miocene? • What causes the glacial cycles? Next time we’ll get into a bit more detail. For now, here are some fun easy things to read. • Brian Fagan, The Long Summer, Basic Books, New York, 2005. Summary available at Azimuth Library. • Chris Turney, Ice, Mud and Blood: Lessons from Climates Past, Macmillan, New York, 2008. • Steven Mithen, After the Ice: A Global Human History 20,000-5000 BC, Harvard University Press, Cambridge, 2005. I couldn’t stomach the style of the second one: it’s written as a narrative, with a character named Lubbock travelling through time. But a lot of people like it, and they say it’s well-researched. • Doug Macdougall, Frozen Earth: The Once and Future Story of Ice Ages, University of California Press, Berkeley, 2004. • Richard W. Battarbee and Heather A. Binney, Natural Climate Variability and Global Warming: a Holocene Perspective, Wiley-Blackwell, Chichester, 2008. • James Zachos, Mark Pagani, Lisa Sloan, Ellen Thomas and Katharina Billups, Trends, rhythms, and aberrations in global climate 65 Ma to present, Science 292 (27 April 2001), 686-693. • Christopher R. Scotes, Paleomap Project. and I urge you to check out this website for a nice visual tour of the Earth’s history. Finally, I thank Frederik de Roo and Nathan Urban for suggesting improvements to this issue. You can see what they said on the Azimuth Forum. If you join the forum, you too can help write This Week’s Finds! I could really use help from earth scientists, biologists, paleontologists and folks like that: I’m okay at math and physics, but I’m trying to broaden the scope now. • Ed Yong, Hacking the genome with a MAGE and a CAGE, Discover, 14 July 2011. • Nicholas Wade, Genetic code of E. coli is hijacked by biologists, New York Times, 14 July 2011. What exactly have they done? These articles explain it quite well… but it’s so cool I can’t resist talking about it. Basically, some scientists from Harvard and MIT have figured out how to go through the whole genome of a bacterium and change every occurrence of one codon to some other codon. It’s a bit like the ‘global search and replace’ feature of a word processor. You know: that trick where you can take a document and replace one word with another every place it appears. To understand this better, it helps to know a tiny bit about the genetic code. You may know this stuff, but let’s quickly review. This long string consists of many sections, which are the instructions to make different proteins. In the first step of the protein manufacture process, a section of this string copied to a molecule called ‘messenger RNA’. In this stage, the T gets copied to uracil, or U. The other three base pairs stay the same. You’ll note that the bases come in groups of three. Each group is called a ‘codon’, because it serves as the code for a specific amino acid. A protein is built as a string of amino acids, which then curls up into a complicated shape. The three-letter names like Phe and Leu are abbreviations for amino acids: phenylalanine, leucine and so on. While there are 43 = 64 codons, they code for only 20 amino acids. So, typically more than one codon codes for the same amino acid. If you look at the chart, you’ll see one exception is methionine, which is encoded only by AUG. AUG is also the ‘start codon’, which tells the cell where a protein starts. So, methionine shows up at the start of every protein, at least at first. It’s usually removed later in the protein manufacture process. UAG was named after Harris Bernstein, whose last name means ‘amber’ in German. The other two names were just a way of continuing the joke. And now we’re ready to understand how a team of scientists led by Farren J. Isaacs and George M. Church are ‘hacking the genome’. They’re going through the DNA of the common E. coli bacterium and replacing every instance of amber with opal! This is a lot more work than the word processor analogy suggests. They need to break the DNA into lots of fragments, change amber to opal in these fragments, and put them back together again. Read Ed Young’s article for more. So, they’re not actually done yet. But when they’re done, they’ll have an E. coli bacterium with no amber codons, just opal. But it’ll act just the same as ever, since amber and opal are both stop codons. That’s a lot of work for no visible effect. What’s the point? The point is that they’ll have freed up the codon amber for other purposes! This will let them do various further tricks. • Nina Mejlhede, Peter E. Nielsen, and Michael Ibba, Adding new meanings to the genetic code, Nature Biotechnology 19 (2001), 532-533. But I guess getting an E. coli that’s completely free of amber codons would let us put amber codons only where we want them, getting better control of the situation. • conjugation: two bacteria come into contact and pass DNA from one to the other. • tranformation: a bacterium produces a loop of DNA called a plasmid, which floats around and then enters another bacterium. • transduction: a virus carries DNA from one bacterium to another. Thanks to these tricks, drug resistance and other traits can hop from one species of bug to another. So, for the sake of safe experiments, it would be nice to have a strain of bacteria whose genetic code was so different from others that it couldn’t share DNA. And third, a bacterium with a modified genetic code could be resistant to viruses! I hadn’t known it, but the biotech firm Genzyme was shut down for three months and lost millions of dollars when its bacteria were hit by a virus. This third application reminds me of a really spooky story by Greg Egan, called “The Moat”. In it, a detective discovers evidence that some people have managed to alter their genetic code. The big worry is that they could then set loose a virus that would kill everyone in the world except them. That’s a scary idea, and one that just became a bit more practical… though so far only for E. coli, not H. sapiens. So, I’ve got some questions for the biologists out there. 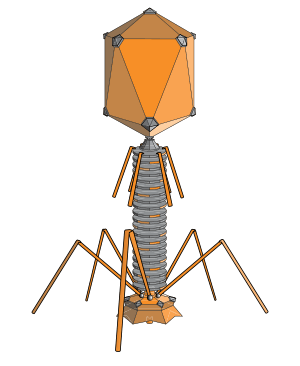 • To what extent are E. coli populations kept under control by phages, or perhaps somehow by other viruses? • If we released a strain of virus-resistant E. coli into the wild, could it take over, thanks to this advantage? • What could the effects be? For example, if the E. coli in my gut became virus-resistant, would their populations grow enough to make me notice? • What are some of the coolest possible applications of this new MAGE/CAGE technology? • What did people actually do with that strain of E. coli that ‘reads through’ amber? • How could such a strain be viable, anyway? Does it mostly avoid using the amber codon, or does it somehow survive having a lot of big proteins where a normal E. coli would have smaller ones? Finally, I can’t resist mentioning something amazing I just read. 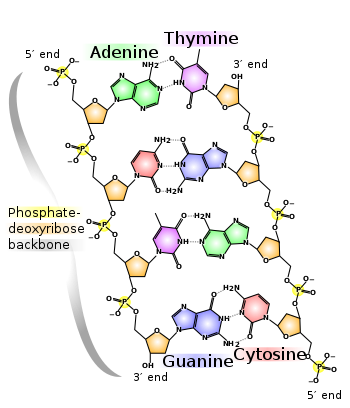 I said that our body uses 20 amino acids, and that ‘opal’ serves a stop codon. But neither of these are the whole truth! 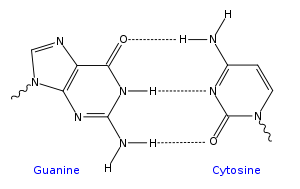 Sometimes opal codes for a 21st amino acid, called selenocysteine. And this one is different from the rest. 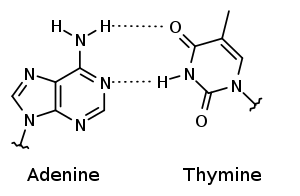 Most amino acids contain carbon, hydrogen, oxygen and nitrogen, and cysteine contains sulfur, but selenocysteine contains… you guessed it… selenium! Selenium is right below sulfur on the periodic table, so it’s sort of similar. If you eat too much selenium, your breath starts smelling like garlic and your hair falls out. Horses have died from the stuff. But it’s also an essential trace element: you have about 15 milligrams in your body. We use it in various proteins, which are called… you guessed it… selenoproteins! • Do humans use selenoproteins containing selenocysteine? • How does our body tell when opal is getting used to code for selenocysteine, and when it’s getting used as a stop codon? • Are there any cool theories about how life evolved to use selenium, and how the opal codon got hijacked for this secondary purpose? • Farren J. Isaacs, Peter A. Carr, Harris H. Wang, Marc J. Lajoie, Bram Sterling, Laurens Kraal, Andrew C. Tolonen, Tara A. Gianoulis, Daniel B. Goodman, Nikos B. Reppas, Christopher J. Emig, Duhee Bang, Samuel J. Hwang, Michael C. Jewett, Joseph M. Jacobson, and George M. Church, Precise manipulation of chromosomes in vivo enables genome-wide codon replacement, Science 333 (15 July 2011), 348-353. This is the second and final part of my interview with Thomas Fischbacher. We’re talking about sustainable agriculture, and he was just about to discuss the role of paying attention to flows. JB: So, tell us about flows. Hence, flows are above everything else a useful conceptual framework—a mental tool devised by us for us—that helps us to make sense of an otherwise extremely complex and confusing natural world. The nice thing about flows is that they reduce complexity by abstracting away details when we do not want to focus on them—such as which particular species are involved in the calcium ion economy, say. Still, they retain a lot of important information, quite unlike some models used by economists that actually guide—or misguide—our present decision-making. They tell us a lot about key processes and longer term behaviour—in particular, if something needs to be corrected. Sustainability is a complex subject that links to many different aspects of human experience—and of course the non-human world around us. When confronted with such a subject, my approach is to start by asking: ‘what I am most certain about’, and use these key insights as ‘anchors’ that set the scene. Everything else must respect these insights. Occasionally, some surprising new insight forces me to reevaluate some fundamental assumptions, and repaint part of the picture. But that’s life—that’s how we learn. Very often, I find that those aspects which are both useful to obtain deeper insights and at the same time accessible to us are related to flows. JB: Can you give an example? TF: Okay, here’s another puzzle. What is the largest flow of solids induced by civilization? JB: Umm… maybe the burning of fossil fuels, passing carbon into the atmosphere? TF: I am by now fairly sure that the answer is: the unintentional export of topsoil from the land into the sea by wind and water erosion, due to agriculture. According to Brady & Weil, around the year 2000, the U.S. annually ‘exported’ about 4×1012 kilograms of topsoil to the sea. That’s roughly three cubic kilometers, taking a reasonable estimate for the density of humus. JB: Okay. In 2007, the U.S. burnt 1.6 × 1012 kilograms of carbon. So, that’s comparable. TF: Yes. When I cross check my number combining data from the NRCS on average erosion rates and from the CIA World Factbook on cultivated land area, I get a result that is within the same ballpark, so it seems to make sense. In comparison, total U.S. exports of economic goods in 2005 were 4.89×1011 kilograms: about an order of magnitude less, according to statistics from the Federal Highway Administration. What actually will happen mostly depends on how wisely we act. The possibilities range from nuclear war to a mostly smooth swift transition to fertility-building food production systems that also take large amounts of CO2 out of the atmosphere and convert it to soil humus. I am, of course, much in favour of scenarios close to the latter one, but that won’t happen unless we put in some effort—first and foremost, to educate people about how it can be done. Flow analysis can be an extremely powerful tool for diagnosis, but its utility goes far beyond this. When we design systems, paying attention to how we design the flow networks of energy, water, materials, nutrients, etc., often makes a world of a difference. Nature is a powerful teacher here: in a forest, there is no ‘waste’, as one system’s output is another system’s input. What else is ‘waste’ but an accumulation of unused output? So, ‘waste’ is an indication of an output mismatch problem. Likewise, if a system’s input is not in the right form, we have to pre-process it, hence do work, hence use energy. Therefore, if a process or system continually requires excessive amounts of energy (as many of our present designs do), this may well be an indication of a design problem—and could be related to an input mismatch. Also, the flow networks of natural systems usually show both extremely high recycling rates and a lot of multi-functionality, which provides resilience. Every species provides its own portfolio of services to the assembly, which may include pest population control, creating habitat for other species, food, accumulating important nutrients, ‘waste’ transformation, and so on. No element has a single objective, in contrast to how we humans by and large like to engineer our systems. Each important function is covered by more than one element. Quite unlike many of our past approaches, design along such principles can have long-term viability. Nature works. So, we clearly can learn from studying nature’s networks and adopting some principles for our own designs. Designing for sustainability with, around, and inspired by natural systems is an interesting intellectual challenge, much like solving a jigsaw puzzle. We cannot simultaneously comprehend the totality of all interactions and relations between adjacent pieces as we build it, but we keep on discovering clues by closely studying different aspects: form, colour, pattern. If we are on the right track, and one clue tells us how something should fit, we will discover that other aspects will fit as well. If we made a mistake, we need to apply force to maintain it and hammer other pieces into place—and unless we correct that mistake, we will need ever more brutal interventions to artificially stabilize the problems which are mere consequences of the original mistake. Think using nuclear weapons to seal off spilling oil wells drilled in deep waters needed because we used up all the easily accessible high-quality fuels. One mistake begets another. There is a reason why jigsaw puzzles ‘work’: they were created that way. There is also a reason why the dance of natural systems ‘works’: coevolution. What happens when we run out of steam to stabilize poor designs (i.e. in an energy crisis)? We, as a society, will be forced to confront our past arrogance and pay close attention to resolving the design mistakes we so far always tried to talk away. That’s something I’d call ‘true progress’. Actually, it’s quite evident now: many of our ‘problems’ are rather just symptoms of more fundamental problems. But as we do not track these down to the actual root, we keep on expending ever more energy by stacking palliatives on top of one another. Growing corn as a biofuel in a process that both requires a lot of external energy input and keeps on degrading soil fertility is a nice example. Now, if we look closer, we find numerous further, superficially unrelated, problems that should make us ask the question: "Did we assemble this part of the puzzle correctly? Is this approach really such a good idea? What else could we do instead? What other solutions would suggest themselves if we paid attention to the hints given by nature?" But we don’t do that. It’s almost as if we were proud to be thick. JB: How would designing with flows in mind work? TF: First, we have to be clear about the boundaries of our domain of influence. Resources will at some point enter our domain of influence and at some point leave it again. This certainly holds for a piece of land on which we would like to implement sustainable food production where one of the most important flows is that of water. But it also holds for a household or village economy, where an important flow through the system is that of purchase power—i.e. money (but in the wider sense). As resources percolate through a system, their utility generally degrades—entropy at work. Water high up in the landscape has more potential uses than water further down. So, we can derive a guiding principle for design: capture resources as early as possible, release them as late as possible, and see that you guide them in such a way that their natural drive to go downhill makes them perform many useful duties in between. Considering water flowing over a piece of land, this would suggest setting up rainwater catchment systems high up in the landscape. This water then can serve many useful purposes: there certainly are agricultural/silvicultural and domestic uses, maybe even aquaculture, potentially small-scale hydropower (say, in the 10-100 watts range), and possibly fire control. JB: When I was a kid, I used to break lots of things. I guess lots of kids do. But then I started paying attention to why I broke things, and I discovered there were two main reasons. First, I might be distracted: paying attention to one thing while doing another. Second, I might be trying to overcome a problem by force instead of by slowing down and thinking about it. If I was trying to untangle a complicated knot, I might get frustrated and just pull on it… and rip the string. I think that as a culture we make both these mistakes quite often. It sounds like part of what you’re saying is: "Pay more attention to what’s going on, and when you encounter problems, slow down and think about their origin a bit—don’t just try to bully your way through them." But the tool of measuring flows is a nice way to organize this thought process. When you first told me about ‘input mismatch problems’ and ‘output mismatch problems’, it came as a real revelation! And I’ve been thinking about them a lot, and I want to keep doing that. One thing I noticed is that problems tend to come in pairs. When the output of one system doesn’t fit nicely into the input of the next, we see two problems. First, ‘waste’ on the output side. Second, ‘deficiency’ on the input side. Sometimes it’s obvious that these are two aspects of the same problem. But sometimes we fail to see it. For example, a while ago some ground squirrels chewed a hole in an irrigation pipe in our yard. Of course that’s our punishment for using too much water in a naturally dry environment, but look at the two problems it created. One: big gushers of water shooting out of the hole whenever that irrigation pipe was used, which caused all sort of further problems. Two: not enough water to the plants that system was supposed to be irrigating. Waste on one side, deficiency on the other. That’s obvious, easy to see, and easy to fix: first plug the hole, then think carefully about why we’re using so much water in the first place. We’d already replaced our lawn with plants that use less water, but maybe we can do better. But here’s a bigger problem that’s harder to fix. Huge amounts of fertilizer are being used on the cornfields of the midwestern United States. With the agricultural techniques they’re using, there’s a constant deficiency of nitrogen and phosphorus, so it’s supplied artificially. The figures I’ve seen show that about 30% of the energy used in US agriculture goes into making fertilizers. So, it’s been said that we’re ‘eating oil’—though technically, a lot of nitrogen fertilizer is made using natural gas. Anyway: a huge deficiency problem. On the other hand, where is all this fertilizer going? In the midwestern United States, a lot of it winds up washing down the Mississipi River. And as a result, there are enormous ‘dead zones’ in the Gulf of Mexico. The fertilizer feeds algae, the algae dies and decays, and the decay process takes oxygen out of the water, killing off any life that needs oxygen. These dead zones range from 15 and 18 thousand square kilometers, and they’re in a place that’s one of the prime fishing spots for the US. So: a huge waste problem. But they’re the same problem! It reminds me of the old joke about a guy who was trying to button his shirt. "There are two things wrong with this shirt! First, it has an extra button on top. Second, it has an extra buttonhole on bottom!" • Bill Mollison, Urban permaculture strategies – part 1, YouTube. While the potential to grow a large amount of calories in cities may be limited, growing fruit and vegetables nevertheless does make sense for multiple reasons. One of them is that many things that previously went into the garbage bin now have a much more appropriate place to go—such as the compost heap. Many urbanites who take up gardening are quite amazed when they realize how much of their household waste actually always ‘wanted’ to end up in a garden. JB: Indeed. After I bought a compost bin, the amount of trash I threw out dropped dramatically. And instead of feeling vaguely guilty as I threw orange peels into the trash where they’d be mummified in a plastic bag in a landfill, I could feel vaguely virtuous as I watched them gradually turn into soil. It doesn’t take as long as you might think. And it comes as a bit of a revelation at first: "Oh, so that’s how we get soil." TF: Perhaps the biggest problem I see with a mostly non-gardening society is that people without even the slightest own experience in growing food are expected to make up their mind about very important food-related questions and contribute to the democratic decision making process. Again, I must emphasize that whoever does not consciously invest some effort into getting at least some minimal first hand experience to improve their judgment capabilities will be easy prey for rat-catchers. And by and large, society is not aware of how badly they are lied to when it comes to food. But back to flows. Every few years or so, I stumble upon a jaw-dropping idea, or a principle, that makes me realize that it is so general and powerful that, really, the limits of what it can be used for are the limits of my imagination and creativity. I recently had such a revelation with the PSLQ integer relation algorithm. Using flows as a mental tool for analysis and design was another such case. All of a sudden, a lot made sense, and could be analyzed with ease. There always is, of course, the ‘man with a hammer problem’—if you are very fond of a new and shiny hammer, everything will look like a nail. I’ve also heard that expressed as ‘an idea is a very dangerous thing if it is the only one you have’. So, while keeping this in mind, now that we got an idea about flows in nature, let us ask: "how can we abuse these concepts?" Mathematicians prefer the term ‘abstraction’, but it’s fun either way. So, let’s talk about the flow of money in economies. What is money? Essentially, it is just a book-keeping device invented to keep track of favours owed by society to individuals and vice versa. What function does it have? It works as ‘grease’, facilitating trade. So, suppose you are a mayor of a small village. One of your important objectives is of course prosperity for your villagers. Your village trades with and hence is linked to an external economy, and just as goods and services are exchanged, so is money. So, at some point, purchase power (in the form of money) enters your domain of influence, and at some point, it will leave it again. What you want it to do is to facilitate many different economic activities—so you want to ensure it circulates within the village as long as possible. You should pay some attention to situations where money accumulates—for everything that accumulates without being put to good use is a form of ‘waste’, hence pollution. So, this naturally leads us to two ideas: (a) What incentives can you find to keep money on circulating within the village? (There are many answers, limited only by creativity.) And (b) what can you do to constrain the outflow? If the outlet is made smaller, system outflow will match inflow at a higher internal pressure, hence a higher level of resource availability within the system. This leads us to an idea no school will ever tell you about—for pretty much the same reason why no state-run school will ever teach how to plan and successfully conduct a revolution. The road to prosperity is to systematically reduce your ‘Need To Earn’—i.e. the best way to spend money is to set up systems that allow you to keep more money in your pocket. An frequent misconception that keeps on arising when I mention this is that some think this idea would be about austerity. Quite to the contrary. You can make as much money as you want—but one thing you should keep in mind is that if you have that trump card up your sleeve that you could at any time just disconnect from most of the economy and get by with almost no money at all for extended periods of time, you are in a far better position to take risks and grasp exceptional opportunities as they arise as someone would be who committed himself to having to earn a couple of thousand pounds a month. The problem is not with earning a lot of money. The problem is with being forced to continually make a lot of money. We readily manage to identify this as a key problem of drug addicts, but fail to see the same mechanism at work in mainstream society. A key assumption in economic theory is that exchange is voluntary. But how well is that assumption satisfied in practice if such forces are in place? Now, what would happen if people started to get serious about investing the money they earn to systematically reduce their need to earn money in the future? Some decisions such as getting a photovoltaic array may have ‘payback times’ in the range of one or two decades, but I consider this ‘payback time’ concept as a self-propagating flawed idea. If something gives me an advantage in terms of depending on less external input now, this reduction of vulnerability also has to be taken into account—’payback times’ do not do that. So—if most people did such things, i.e. made strategic decisions to set up systems so that their essential needs can be satisfied with minimal effort—especially money, this would put a lot of political power back into their hands. A number of self-proclaimed ‘leaders’ certainly don’t like the idea of people being in a position to just ignore their orders. Also note that this would have a funny effect on the GDP—ever heard of ‘imputations’? JB: No, what are those? Evidently, if people make a dedicated effort at the household level to become less dependent on the economy by being able to provide most of their essential needs themselves (housing, food, water, energy, etc.) to a much larger extent, this amounts to investing money in order to need less money in the future. If many people did this systematically, it would superficially have a devastating effect on the GDP—but it would bring about a much more resilient (because less dependent) society. The problem is that the GDP really is not an appropriate measure for progress. But obviously, those who publish these figures know that as well, hence the need to fudge the result with imputations. So, a simple conclusion is: whenever there is an opportunity to invest money in a way that makes you less dependent on the economy in the future, that might be well worth a closer look. Especially if you get the idea that, if many people did this, the state would likely have to come up with other imputations to make the impact on the GDP disappear! JB: That’s a nice thought. I tend to worry about how the GDP and other economic indicators warp our view of what’s right to do. But you’re saying that if people can get up the nerve to do what’s right, regardless, the economic indicators may just take care of themselves. TF: We have to remember that sustainability is about systems that are viable in the long run. Environmental sustainability is just one important aspect. But you won’t go on for long doing what you do unless it also has economic long-term viability. Hence, we are dealing with multi-dimensional design constraints. And just as flow network analysis is useful to get an idea about the environmental context, the same holds for the economic context. It’s just that the resources are slightly different ones—money, labour, raw materials, etc. These thoughts can be carried much further, but I find it quite worthwhile to instead look at an example where someone did indeed design a successful system along such principles. In the UK, the first example that would come to my mind is Hill Holt Wood, because the founding director, Nigel Lowthrop, did do so many things right. I have high admiration for his work. JB: When it comes to design of sustainable systems, you also seem to be a big fan of Bill Mollison and some of the ‘permaculture’ movement that he started. Could you say a bit about that? Why is it important? TF: The primary reason why permaculture matters is that it has demonstrated some stunning successes with important issues such as land rehabilitation. ‘Permaculture’ means a lot of different things to a lot of different people. Curiously, where I grew up, the term is somewhat known, but mostly associated with an Austrian farmer, not Bill Mollison. And I’ve seen some physicists who first had come into contact with it through David Holmgren‘s book revise their opinions when they later read Mollison. Occasionally, some early adopters did not really understand the scientific aspects of it and tried to link it with some strange personal beliefs of the sort Martin Gardner discussed in Fads and Fallacies in the Name of Science. And so on. So, before we discuss permaculture, I have to point out that one might sometimes have to take a close look to evaluate it. A number of things claiming to be ‘permaculture’ actually are not. When I started—some time ago—to make a systematic effort to get a useful overview over the structure of our massive sustainability-related problems, a key question to me always was: "what should I do? "—and a key conviction was: "someone must have had some good ideas about all this already." This led me to actually not read some well-known "environmentalist" books many people had read which are devoid of any discussion of our options and potential solutions, but to do a lot of detective work instead. In doing so, I travelled, talked to a number of people, read a lot of books and manuscripts, did a number of my own experiments, cross-checked things against order-of-magnitude guesstimates, against the research literature, and so on. At one point—I think it was when I took a closer look into the work of the laureates of the ‘Right Livelihood award’ (sometimes called the ‘Alternative Nobel Prize’)—I came across Bill Mollison’s work. And it struck a chord. Back in the 90s, when mad cow disease was a big topic in Europe, I spent quite some time pondering questions such as: "what’s wrong with the way farming works these days?" I immediately recognized a number of insights I independently had arrived at back then when studying Bill Mollison’s work, and yet, he went so much further—talked about a whole universe of issues I still was mostly unaware of at that time. So, an inner voice said to me: "if you take a close look at what that guy already did, that might save you a lot of time". Now, Mollison did get some things wrong, but I still think taking a close look at what he has to say is a very effective way to get a big picture overview over what we can achieve, and what needs urgent attention. I think it greatly helps (at least to me) that he comes from a scientific background. Before he decided to quit academia in 1978 and work full time on developing permaculture, he was a lecturer at the University of Hobart, Tasmania. JB: But what actually is ‘permaculture’? TF: That depends a lot on who you ask, but I like to think about permaculture as if it were an animal. The ‘skeleton’ is a framework with cleverly designed ‘static properties’ that holds the ‘flesh’ together in a way so that it can achieve things. The actual ‘flesh’ is provided by solutions to specific problems with long term viability being a key requirement. But it is more than just a mere semi-amorphous collage of solutions, due to its skeleton. The backbone of this animal is a very simple (deliberately so) yet functional (this is important) core ethics which one could regard as being the least common denominator of values considered as essential across pretty much all cultures. This gives it stability. Other bones that make this animal walk and talk are related to key principles. And these principles are mostly just applied common sense. For example, it is pretty clear that as non-renewable resources keep on becoming more and more scarce, we will have to seriously ponder the question: what can we grow that can replace them? If our design constraints change, so does our engineering—should (for one reason or another) some particular resource such as steel become much more expensive than it is today, we would of course look into the question whether, say, bamboo may be a viable alternative for some applications. And that is not as exotic an idea as it may sound these days. So, unquestionably, the true solutions to our problems will be a lot about growing things. But growing things in the way that our current-day agriculture mostly does it seems highly suspicious, as this keeps on destroying soil. So, evidently, we will have to think less along the lines of farming and more along the lines of gardening. Also, we must not fool ourselves about a key issue: most people on this planet are poor, hence for an approach to have wide impact, it must be accessible to the poor. Techniques that revolve around gardening often are. Next, isn’t waiting for the big (hence, capital intensive) ‘technological miracle fix’ conspicuously similar to the concept of a ‘pie in the sky’? If we had any sense, shouldn’t we consider solving today’s problems with today’s solutions? If one can distinguish between permaculture as it stands and attempts by some people who are interested in it to re-mold it so that it becomes ‘the permaculture part of permaculture plus Anthroposophy/Alchemy/Biodynamics/Dianetics/Emergy/Manifestation/New Age beliefs/whatever’, there is a lot of common sense in permaculture—the sort of ‘a practical gardener’s common sense’. In this framework, there is a place for both modern scientific methods and ancient tribal wisdom. I hence consider it a healthy antidote to both fanatical worship of ‘the almighty goddess of technological progress’—or any sort of fanatical worship for that matter—as well as to funny superstitious beliefs. There are some things in the permaculture world, however, where I would love to see some change. For example, it would be great if people who know how to get things done paid more attention to closely keeping records of what they do to solve particular problems and to making these widely accessible. Solutions of the ‘it worked great for a friend of a friend’ sort do us a big disservice. Also, there are a number of ideas that easily get represented in overly simplistic form—such as ‘edge is good’—where one better should retain some healthy skepticism. JB: Well, I’m going to keep on pressing you: what is permaculture… according to you? Can you list some of the key principles? TF: That question is much easier to answer. The way I see it, permaculture is a design-oriented approach towards systematically reducing the total effort that has to be expended (in particular, in the long run) in order to keep society going and allow people to live satisfying lives. Here, ‘effort’ includes both work that is done by non-renewable resources (in particular fossil fuels), as well as human labour. So, permaculture is not about returning to pre-industrial agricultural drudgery with an extremely low degree of specialization, but rather about combining modern science with traditional wisdom to find low-effort solutions to essential problems. In that sense, it is quite generic and deals with issues ranging from food production to water supply to energy efficient housing and transport solutions. To give one specific example: Land management practices that reduce the organic matter content of soils and hence soil fertility are bound to increase the effort needed to produce food in the long run and hence considered a step in the wrong direction. So, a permaculture approach would focus on using strategies that manage to build soil fertility while producing food. There are a number of ways to do that, but a key element is a deep understanding of nature’s soil food web and nutrient cycling processes. For example, permaculture pays great attention to ensuring a healthy soil microflora. When the objective is to minimize the effort needed to sustain us, it is very important to closely observe those situations where we have to expend energy on a continual basis in order to fight natural processes. When this happens, there is a conflict between our views how things ought to look like and a system trying to demonstrate its own evolution. In some situations, we really want it that way and have to pay the corresponding price. But there are others—quite many of them—where we would be well advised to spend some thought on whether we could make our life easier by ‘going with the flow’. If thistles keep on being a nuisance on some piece of land, we might consider trying to fill this ecological niche by growing some closely related species, say some artichoke. If a meadow needs to be mowed regularly so that it does not turn into a shrub thicket, we would instead consider planting some useful shrubs in that place. • Raju Titus’s Public Gallery, Picasa. An interesting perspective towards weeds which we usually do not take is: the reason this plant could establish itself here is that it’s filling an unfilled ecological niche. JB: Actually I’ve heard someone say: "If you have weeds, it means you don’t have enough plants". TF: Right. So, when I take that weed out, I’d be well advised to take note of nature’s lesson and fill that particular niche with an ecological analog that is more useful. Otherwise, it will quite likely come back and need another intervention. I would consider this "letting systems demonstrate their own evolution while closely watching what they want to tell us and providing some guidance" the most important principle of permaculture. Another important principle is the ‘user pays‘ principle. A funny idea that comes up disturbingly often up in discussions of sustainability issues (even if it is not articulated explicitly) is that there are only a limited amount of resources which we keep on using up, and once we are done with that, this would be the end of mankind. Actually, that’s not how the world works. Take an apple tree, for example. It starts out as a tiny seed, and has to accumulate a massive amount of (nutrient) resources to grow into a mature tree. Yet, once it completes its life cycle, dies down and is consumed by fungi, it leaves the world in a more fertile state than before. Fertility tends to keep growing, because natural systems by and large work according to the principle that any agent that takes something from the natural world will return something of equal or even greater ecosystemic value. • W. D. Gallup, Ruminant nutrition, review of utilization of nonprotein nitrogen in the ruminant, Journal of Agricultural and Food Chemistry 4 (1956), 625-627. 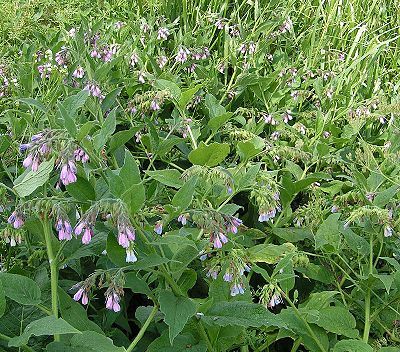 A completely different example: nutrient accumulators such as comfrey act as powerful pumps that draw up mineral nutrients from the subsoil, where they would be otherwise inaccessible, and make them available for ecosystemic cycling. It is indeed possible to not only use this concept for garden management, but as a fundamental principle to run a sustainable economy. At the small scale (businesses), its viability has been demonstrated, but unfortunately this aspect of permaculture has not received as much attention yet as it should. Here, the key questions are along the lines of: do you need a washing machine, or is your actual need better matched by the description ‘access to some laundry service’? Concerning energy and material flows, an important principle is "be aware of the boundaries of your domain of influence, capture them as early as you can, release them as late as you can, and extract as much beneficial use out of them as possible in between". We already talked about that. In the era of cheap labour from fossil fuels, it is often a very good idea to use big earthworking machinery to slightly adjust the topography of the landscape in order to capture and make better use of rainwater. Done right, such water harvesting earthworks can last many hundreds of years, and pay back the effort needed to create them many times over in terms of enhanced biological productivity. If this were implemented on a broad scale, not just by a small percentage of farmers, this could add significantly to flood protection as well. I am fairly confident that we will be doing this a lot in the 21st century, as the climate gets more erratic and we face both more extreme rainfall events (note that saturation water vapour pressure increases by about 7% for every Kelvin of temperature increase) as well as longer droughts. It would be smart to start with this now, rather than when high quality fuels are much more expensive. It would have been even smarter to start with this 20 years ago. A further important principle is to create stability through a high degree of network connectivity. We’ve also briefly talked about that already. In ecosystem design, this means to ensure that every important ecosystemic function is provided by more than one element (read: species), while every species provides multiple functions to the assembly. So, if something goes wrong with one element, there are other stabilizing forces in place. The mental picture which I like to use here is that of a stellar cluster: If we put a small number of stars next to one another, the system will undergo fairly complicated dynamics and eventually separate: in some three-star encounters, two stars will enter a very close orbit, while the third receives enough energy to go over escape velocity. If we lump together a large number of stars, their dynamics will thermalize and make it much more difficult for an individual star to obtain enough energy to leave the cluster—and keep it for a sufficiently long time to actually do so. Of course, individual stars do ‘boil off’, but the entire system does not fall apart as fast as just a few stars would. There are various philosophies how to best approach weaving an ecosystemic net, ranging from ‘ecosystem mimicry‘;—i.e. taking wild nature and substituting some species with ecological analogs that are more useful to us—to ‘total synthesis of a species assembly’, i.e. combining species which in theory should grow well together due to their ecological characteristics, even though they might never have done so in nature. JB: Cool. You’ve given me quite a lot to think about. Finally, could you also leave me with a few good books to read on permaculture? • Bill Mollison, Introduction to Permaculture, Tagari Publications, Tasmania, 1997. 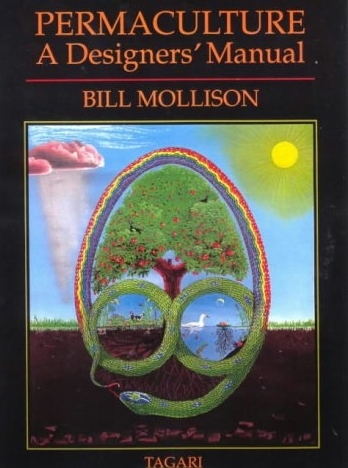 • Bill Mollison, Permaculture – A Designer’s Manual, Tagari Publications, Tasmania, 1988. • Patrick Whitefield, The Earth Care Manual: a Permaculture Handbook for Britain and Other Temperate Climates, Permanent Publications, East Meon, 2004. For Europeans, this would probably be my first recommendation. JB: Thanks! It’s been a very thought-provoking interview. This week I’d like to start an interview with Thomas Fischbacher, who teaches at the School of Engineering Sciences at the University of Southampton. He’s a man with many interests, but we’ll mainly talk about sustainable agriculture, leading up to an idea called "permaculture". JB: Your published work is mainly in theoretical physics, and some of it is quite mathematical. You have a bunch of papers on theories of gravity related to string theory, and another bunch on magnetic materials, maybe with some applications to technology. But you’re also interested in sustainable agricultural and building practices! That seems like quite a leap… but I may be trying to make a similar leap myself, so I find it fascinating. How did you get interested in these other topics, which seem so very different in flavor? TF: I think it’s quite natural that one’s interests are wider than what one actually publishes about—quite likely, the popularity of your blog which is about all sorts of interesting things witnesses this. However, if something that seems interesting catches my attention, I often experience a strong drive to come to an advanced level of understanding—at least mastering the key mechanisms. As far as I can think back, my studies have been predominantly self-directed, often following very unusual and sometimes obscure paths, so I sometimes happen to know a few quite odd things. And actually, considering research, I get a lot of fun out of combining advanced ideas from very different fields. Most of my articles are of that type, e.g. "sparse tensor numerics meets database algorithms and metalinguistics", or "Feynman diagrams meet lazy evaluation and continuation coding", or "Exceptional groups meet sensitivity back-propagation". Basically, I like to see myself in the role of a bridge-builder. Very often, powerful ideas that have been developed in one field are completely unknown in another where they actually can be used to great advantage. Concerning sustainability, it actually was mostly soil physics that initially got me going. When dealing with a highly complex phenomenon such as human civilization, it is sometimes very useful to take a close look at matter and energy flows in order to get an overview over important processes that determine the structure and long term behaviour of a system. Just doing a few order-of-magnitude guesstimates and looking at typical soil erosion and soil formation rates, I found that, from that perspective, quite a number of fundamental things did not add up and told a story very different from the oh-so-glorious picture of human progress. That’s one of the great things about physical reasoning: it allows one to independently make up one’s mind about things where one otherwise would have little other choice than to believe what one is told. And so, I started to look deeper. • Neil Roberts, The Holocene: an Environmental History, Blackwell, London, 1998. It describes how the landscape of Europe has been cycling through glacial and interglacial periods every 100,000 years or so for the last 1.3 million years. It’s a regular sort of pattern! As a glacial period ends, first comes a phase when birches and pines immigrate from southern refuges into what had been tundra. Then comes a phase when mixed deciduous forest takes over, with oak and elm becoming dominant. During this period, rocky soils turn into brown forest soils. Next, leaching from rocks in glacial deposits leads to a shift from neutral to acid soils, which favor trees like spruce. Then, as spruce take over, fallen needles make the soil even more acid. Together with cooling temperatures as the next glacial approaches, this leads to the replacement of deciduous forest by heathland and pine forests. Finally, glaciers move in and scrape away the soil. And then the cycle repeats! It was believed by classical authors such as Varro and Seneca that there had once been a "Golden Age", "when man lived on those things which the virgin earth produced spontaneously" and when "the very soil was more fertile and productive." If ever there was such a "Golden Age" then surely it was in the early Holocene, when soils were still unweathered and uneroded, and when Mesolithic people lived off the fruits of the land without the physical toil of grinding labour. Still unweathered and uneroded! So it takes an ice age to reset the clock and bring soils back to an optimum state? TF: There are a number of different processes, all of them important, that are associated with very different time scales. A general issue here is that, as a society, we have difficulties to get an idea how our life experience is shaped by our cultural heritage, by our species’ history, and by events that happened tens of thousands of years ago. Coming to the cycles of glaciation, you are right that these shaped the soils in places such as Europe, by grinding down rock and exposing freshly weathered material. But it is also interesting to look at places where this has not happened—to give us sort of an outside perspective; glaciation was fairly minimal in Australia, for example. Also, the main other player, volcanism did not have much of an effect in exposing fresh minerals there either. And so, Australian soils are extremely old—millions of years, tens of millions of years even, and very poor in mineral nutrients, as so much has been leached out. This has profound influences on the vegetation, but also on fauna, and of course on the people who inhabited this land for tens of thousands of years, and their culture: the Aborigines. Now, I don’t want to claim that the Aborigines actually managed to evolve a fully "sustainable" system of land management—but it should be pretty self-evident that they must have developed some fairly interesting biological knowledge over such a long time. Talking about long time scales and the long distant past, it sometimes takes a genius to spot something that in hindsight is obvious but no one noticed because the unusual situation is that the really important thing that matters is missing. Have you ever wondered, for example, what animal might eat an avocado and disperse its fairly large seed? Like other fruit (botanically speaking, the avocado is a berry, as is the banana), the avocado plant co-evolved with animals that would eat its fruits—but there is no animal around that would do so. 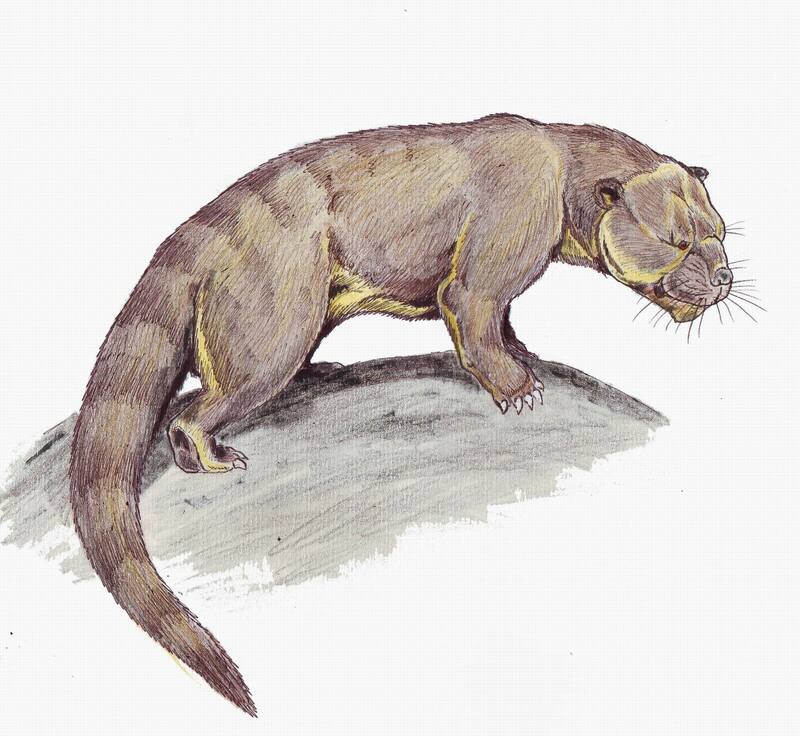 Basically, the reason is that we are looking at a broken ecosystem: the co-evolutionary partners of the avocado, such as gomphotheres, became extinct some thousands of years ago. Considering soils, the cycle of glaciations already should hold an important lesson for us. It is important to note that the plow is basically an invention that (somewhat) suits European agriculture and its geologically young soils. What happens if we take this way of farming to the tropics? While lush and abundant rainforests may seem to suggest otherwise, we have old and nutrient-poor soils here, and most mineral nutrients get stored and cycled by the vegetation. If we clear this, we release a flush of nutrients, but as the annual crops which we normally grow are not that good at holding on to these nutrients, we rapidly destroy the fertility of the land. There are alternative options for how to produce food in such a situation, but before we look into this, it might be useful to know a few important ballpark figures related to agriculture—plow agriculture in particular. The most widely used agricultural unit for "mass per area" is "metric tons per hectare", but I will instead use kilograms per square meter (as some people may find that easier to relate to), 1 kilogram per square meter being 10 tons/ha. Depending on the climate (windspeeds, severity of summer rains, etc. ), plow agriculture will typically lead to soil loss rates due to erosion of something in the ballpark of 0.5 to 5 kilograms per square meter per year. In the US, erosion rates in the past have been as high as 4 kilograms per square meter per year and beyond, but have come down markedly. Still, soil loss rates of around 1 kilogram per square meter per year are not uncommon for the US. The problem is that, under good conditions, soil creation rates are in the ballpark of 0.02 to 0.2 kilograms per square meter per year. So, our present agriculture is destroying soil much faster than new soil gets formed. And, quite insidiously, erosion will always carry away the most fertile top layer of soil first. • Food and Agriculture Organization of the UN, FAOSTAT. Concerning ancient reports of a "Golden Age"—I am not so sure about this anymore. By and large, civilizations mostly seem to have had quite a negative long term impact on the soil fertility that sustained them—and a number of them failed due to that. But all things considered, we often find that some particular groups of species have a very positive long term effect on fertility and counteract nutrient leaching—tropical forests bear witness to that. Now… what single species we can think of would be best equipped to make a positive contribution towards long-term fertility building? JB: Hey, no fair—I thought I was the one asking the questions! Hmm, I don’t know. Maybe some sort of rhizobium? You know, those bacteria that associate themselves to the roots of plants like clover, alfalfa and beans, and take nitrogen from the air and convert it to a form that’s usable by the plants? But you said "one single species", so this answer is probably not right: there are lots of species of rhizobia. TF: The answer is quite astounding—and it lies at the heart of understanding sustainability. The species that could have the largest positive impact on soil fertility is Homo sapiens—us! Now, considering the enormous ecological damage that has been done by that single species, such a proposition may seem quite outrageous. But note that I asked about the potential to make a positive contribution, not actual behaviour as observed so far. JB: Oh! I should have guessed that. Darn! TF: When I bring up this point, many people think that I might have some specific technique in mind, a "miracle cure", or "silver bullet" idea such as, say, biochar—which seems to be pretty en vogue now—or genetically engineered miracle plants, or some such thing. But no—this is about a much more fundamental issue. Nature eventually will heal ecological wounds—but quite often, she is not in a particular hurry. Left to her own devices, she may take thousands of years to rebuild soils and turn devastated land back into fertile ecosystems. Now, this is where we enter the scene. With our outstanding intellectual power we can read landscapes, think about key flows—flows of energy, water, minerals, and living things through a site—and if necessary, provide a little bit of guidance to help nature take the next step. This way, we can often speed up the regeneration clock a hundredfold or more! Let me give some specific examples. Technologically, these are often embarrassingly simple—yet at the same time highly sophisticated, in the sense that they address issues that are obvious only once one has developed an eye for them. The first one is imprinting—in arid regions, this can be a mind-blowingly simple yet quite effective technology to kick-start a biological succession pathway. • The Imprinting Foundation, Success Stories. • Bill Mollison, Dryland permaculture strategies—part 3, YouTube. Here is another example—getting the restoration of rainforest going in the tropical grasslands of Colombia. • Zero Emissions Research and Initiatives (ZERI), Reforestation. Here, the challenge is that the soil originally was so acidic (around pH 4) that aluminium went into the soil solution as toxic Al3+. What eventually managed to do the trick was to plant a nurse crop of Caribbean pines, Pinus caribbea (on 80 square kilometers—no mean feat) that have been provided with the right mycorrhizal symbiont (Pisolithus tinctorius, I think) that enabled the trees to grow in very acidic soil. An amazing subject in themselves, fungi, by the way. These were big projects—but similar ideas work on pretty much any scale. Friends of mine have shown me great pictures of the progress of a degraded site in Nepal where they did something very simple a number of years ago—puting up four poles with strings between them on which birds like to gather. And personally, since I started to seriously ponder the issue of soil compaction and started to give double-digging a try in my own garden a few years ago, the results have been so amazing that I wonder why anyone bothers to garden with annuals any other way. TF: A method to relieve soil compaction. As we humans live our lives above the soil, processes below can be rather alien to us—yet, this is where many very important things go on. By and large, most people do not realize how deep plant roots go—and how badly they are affected by compaction. The term "double-digging" refers to digging out the top foot of topsoil from the bed, and then using a gardening fork to also loosen the next foot of soil (often subsoil) before putting back the topsoil. Now, this method does have its drawbacks, and also, it is not the "silver bullet" single miracle recipe for high gardening yields some armchair gardeners who have read Jeavons’s book believe it to be. But if your garden soil is badly compacted, as it often is the case when starting a new garden, double-digging may be a very good idea. TF: So, there is no doubt that our species can vastly accelerate natural healing processes. Indeed, we can link our lives with natural processes in a way that satisfies our needs while we benefit the whole species assembly around us—but there are some very non-obvious aspects to this. Hacking a hole into the forest to live "in harmony with nature" most certainly won’t do the trick. The importance of the key insight—we have the capacity to act as the most powerful repair species around—cannot be overstated. There is at present a very powerful mental block that shows up in many discussions of sustainability: looking at our past conduct, it is easy to get the idea that Homo sapiens‘ modus operandi is to seek out the most valuable/powerful/convenient resource first, use this up, and then, driven by need, find ways to make do with the next most valuable resource, calling this "progress"—actually a downward spiral. I’ve indeed seen adverts for the emerging Liquefied Natural Gas industry that glorified this as "a motor of progress and growth". Now, the only reason why we consider this is that the more easily-accessible, easy-to-handle fuels have been pretty much used up. Same with deep-sea oil drilling. What kind of "progress" is it that the major difference between the recent oil spill in the Gulf of Mexico and the Ixtoc oil spill in 1979 is that this time, there’s a mile of water sitting on top of the well—because we used up the more easily accessible oil? • Rachel Maddow, Ixtoc Deepwater Horizon parallels, YouTube. One is some form of "denial". This is quite widespread amongst professional economists. Ultimately, the absurdity of their argument becomes clear when it is condensed to "sustainability is just one problem among many, and we are the better at solving problems the stronger our economy—so we need to use up resources fast to get rich fast so that we can afford to address the problems caused by us using up resources fast." Reminds me of a painter who lived in the village I grew up in. He was known to work very swiftly, and when asked why he always was in such a hurry, wittily replied: "but I have to get the job done before I run out of paint!" The other attitude is some sort of self-hate that regards the key problem not as an issue of very poor management, but inherently linked to human existence. According to that line of thinking, collapse is inevitable and we should just make sure we do not gobble up resources so fast that we leave nothing for our children to despoil so that they can have a chance to live. It is clear that as long as there is a deadlock between these two attitudes, we will not make much progress towards a noticeably more sustainable society. And waiting just exacerbates the problem. So, the key question is: does it really have to be like this—are we doomed to live by destroying the resources which we depend on? Well—every cow can do better than that. Cow-dung is more valuable in terms of fertility than what the cow has eaten. So, if we are such an amazing species—as we like to claim by calling ourselves "Homo sapiens"—why should we fail so miserably here? JB: I can see all sorts of economic, political and cultural reasons why we do so badly. But it might be a bit less depressing to talk about how we can do better. For example, you mentioned paying attention to flows through systems. TF: The important thing about flows is that they are a great concept tool to get some first useful ideas about those processes that really matter for the behaviour of complex systems—both for the purpose of analysis as well as design. That’s quite an exciting subject, but as you mentioned it, I’d first like to briefly address the issue of depressing topics that frequently arise when taking a deeper look into sustainability—in particular, the present situation. Why? Because I think that our capacity as a society to deal with such emotions will be decisive for how well we will do or how badly we will fail when addressing a set of convergent challenges. On the one hand, it is very important to understand that such emotions are an essential part of human experience. On the other hand, they can have a serious negative impact on our judgment capacity. So, an important part of the sustainability challenge is to build the capacity to act and make sound decisions under emotional stress. That sounds quite obvious, but my impression is that, still, most people either are not yet fully aware of this point, or do not see what this idea might mean in practice. JB: I’ve been trying to build that capacity myself. I don’t think mathematics or theoretical physics were very good at preparing me. Indeed, I suspect that many people in these fields enjoy not only the feeling of "certainty" they can provide, but also the calming sense that the universe is beautiful and perfect. When it comes to environmental issues there’s a lot more uncertainty, and also frequently the sense that the world is messed up—thanks to us! On top of that there’s a sense of urgency, and frustration. All this can be rather stressful. However, there are ways to deal with that, and I’m busy learning them. TF: I think there is one particularly important lesson I have learned about the role of emotions, especially fear. Important because it probably is quite a fundamental part of the human condition. Emotions do have the power to veto some conclusions from ever surfacing in one’s conscious mind if they would be painful to bear. They can temporarily suspend sound reasoning and also access to otherwise sound memory. This is extremely sinister, for you are not acting rationally at all, you are in fact driven by one of the most non-rational aspects of your existence, your fear, yet you yourself have next to no chance of ever discovering this, as your emotions abuse your cognitive abilities to systematically shield you from getting conscious access to any insight which would stand a chance of making you question your analysis. JB: I think we can all name other people who suffer from this problem. But of course the challenge is to see it in ourselves, while it’s happening. TF: Insidiously, having exceptional reasoning abilities will not help the very least bit here—a person with a powerful mind may be misguided as easily as anybody else by deep inner fears, it’s just that the mind of a person with strong reasoning skills will work harder and spin more sophisticated tales than that of an intellectually average person. So, this essentially is a question of "how fast a runner do you have to be to out-run your own shadow?" How intelligent do you have to be to recognize it when your emotions cause your mind to abuse your powerful reasoning abilities to deceive itself? Well, the answer probably is that the capacity to appreciate in oneself the problem of self-deception is not related to intelligence, but wisdom. I really admire the insight that "it’s hard to fight an enemy who has outposts in your head." JB: Richard Feynman put it another way: "The first principle is that you must not fool yourself—and you are the easiest person to fool." And if you’re sure you’re not fooling yourself, then you definitely are. TF: Of course, everything that has an impact on our ability to conduct a sound self-assessment of our own behaviour matters a lot for sustainability related issues. But enough about the role of the human mind in all this. This certainly is a fascinating and important subject, but at the end of the day, there is a lot of ecosystem rehabilitation to be done, and mapping flows is a powerful approach to getting an idea about what is broken and how to repair it. JB: Okay, great. But I think our readers need a break. Next time we’ll pick up where we left off, and talk about flows. 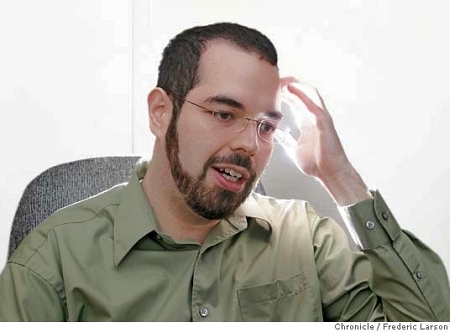 This week I’ll start an interview with Eliezer Yudkowsky, who works at an institute he helped found: the Singularity Institute of Artificial Intelligence. While many believe that global warming or peak oil are the biggest dangers facing humanity, Yudkowsky is more concerned about risks inherent in the accelerating development of technology. There are different scenarios one can imagine, but a bunch tend to get lumped under the general heading of a technological singularity. Instead of trying to explain this idea in all its variations, let me rapidly sketch its history and point you to some reading material. Then, on with the interview! In 1965, the British mathematician Irving John Good raised the possibility of an "intelligence explosion": if machines could improve themselves to get smarter, perhaps they would quickly become a lot smarter than us. • Vernor Vinge, The coming technological singularity: how to survive in the post-human era, article for the VISION-21 Symposium, 30-31 March, 1993. What, then, is the Singularity? It’s a future period during which the pace of technological change will be so rapid, its impact so deep, that human life will be irreversibly transformed. Although neither utopian or dystopian, this epoch will transform the concepts we rely on to give meaning to our lives, from our business models to the cycle of human life, including death itself. Understanding the Singularity will alter our perspective on the significance of our past and the ramifications for our future. To truly understand it inherently changes one’s view of life in general and one’s particular life. I regard someone who understands the Singularity and who has reflected on its implications for his or her own life as a "singularitarian". • Ray Kurzweil, The Singularity is Near: When Humans Transcend Biology, Viking, 2005. • Accelerating Change that is nonetheless somewhat predictable (e.g. Ray Kurzweil). • Event Horizon: after the rise of intelligence beyond our own, the future becomes absolutely unpredictable to us (e.g. Vernor Vinge). • Intelligence Explosion: a rapid chain reaction of self-amplifying intelligence until ultimate physical limits are reached (e.g. I. J. Good and Eliezer Yudkowsky). • The Singularity Institute of Artificial Intelligence, Publications. • Baloney: it’s all a load of hooey! • Technological singularity: Criticism, Wikipedia. Personally, what I like most about singularitarians is that they care about the future and recognize that it may be very different from the present, just as the present is very different from the pre-human past. I wish there were more dialog between them and other sorts of people—especially people who also care deeply about the future, but have drastically different visions of it. I find it quite distressing how people with different visions of the future do most of their serious thinking within like-minded groups. This leads to groups with drastically different assumptions, with each group feeling a lot more confident about their assumptions than an outsider would deem reasonable. I’m talking here about environmentalists, singularitarians, people who believe global warming is a serious problem, people who don’t, etc. Members of any tribe can easily see the cognitive defects of every other tribe, but not their own. That’s a pity. JB: I’ve been a fan of your work for quite a while. At first I thought your main focus was artificial intelligence (AI) and preparing for a technological singularity by trying to create "friendly AI". But lately I’ve been reading your blog, Less Wrong, and I get the feeling you’re trying to start a community of people interested in boosting their own intelligence—or at least, their own rationality. So, I’m curious: how would you describe your goals these days? EY: My long-term goals are the same as ever: I’d like human-originating intelligent life in the Solar System to survive, thrive, and not lose its values in the process. And I still think the best means is self-improving AI. But that’s a bit of a large project for one person, and after a few years of beating my head against the wall trying to get other people involved, I realized that I really did have to go back to the beginning, start over, and explain all the basics that people needed to know before they could follow the advanced arguments. Saving the world via AI research simply can’t compete against the Society for Treating Rare Diseases in Cute Kittens unless your audience knows about things like scope insensitivity and the affect heuristic and the concept of marginal expected utility, so they can see why the intuitively more appealing option is the wrong one. So I know it sounds strange, but in point of fact, since I sat down and started explaining all the basics, the Singularity Institute for Artificial Intelligence has been growing at a better clip and attracting more interesting people. • How to actually change your mind. • Mysterious answers to mysterious questions. My current sense of the problems of self-modifying decision theory is that it won’t end up being Deep Math, nothing like the proof of Fermat’s Last Theorem—that 95% of the progress-stopping difficulty will be in figuring out which theorem is true and worth proving, not the proof. (Robin Hanson spends a lot of time usefully discussing which activities are most prestigious in academia, and it would be a Hansonian observation, even though he didn’t say it AFAIK, that complicated proofs are prestigious but it’s much more important to figure out which theorem to prove.) Even so, I was a spoiled math prodigy as a child—one who was merely amazingly good at math for someone his age, instead of competing with other math prodigies and training to beat them. My sometime coworker Marcello (he works with me over the summer and attends Stanford at other times) is a non-spoiled math prodigy who trained to compete in math competitions and I have literally seen him prove a result in 30 seconds that I failed to prove in an hour. I’ve come to accept that to some extent we have different and complementary abilities—now and then he’ll go into a complicated blaze of derivations and I’ll look at his final result and say "That’s not right" and maybe half the time it will actually be wrong. And when I’m feeling inadequate I remind myself that having mysteriously good taste in final results is an empirically verifiable talent, at least when it comes to math. This kind of perceptual sense of truth and falsity does seem to be very much important in figuring out which theorems to prove. But I still get the impression that the next steps in developing a reflective decision theory may require me to go off and do some of the learning and training that I never did as a spoiled math prodigy, first because I could sneak by on my ability to "see things", and second because it was so much harder to try my hand at any sort of math I couldn’t see as obvious. I get the impression that knowing which theorems to prove may require me to be better than I currently am at doing the proofs. On some gut level I’m also just embarrassed by the number of compliments I get for my math ability (because I’m a good explainer and can make math things that I do understand seem obvious to other people) as compared to the actual amount of advanced math knowledge that I have (practically none by any real mathematician’s standard). But that’s more of an emotion that I’d draw on for motivation to get the job done, than anything that really ought to factor into my long-term planning. For example, I finally looked up the drop-dead basics of category theory because someone else on a transhumanist IRC channel knew about it and I didn’t. I’m happy to accept my ignoble motivations as a legitimate part of myself, so long as they’re motivations to learn math. JB: Ah, how I wish more of my calculus students took that attitude. Math professors worldwide will frame that last sentence of yours and put it on their office doors. … I have almost always felt fortunate to have been able to do research in a mathematics environment. The average competence level is high, there is a rich history, the subject is stable. All these factors are conducive for science. At the same time, I was never able to feel unequivocally part of the mathematics culture, where, it seems to me, too much value is put on difficulty as a virtue in itself. My appreciation for mathematics has more to do with its clarity of thought, its potential of sharply articulating ideas, its virtues as an unambiguous language. I am more inclined to treasure the beauty and importance of Shannon’s ideas on errorless communication, algorithms such as the Kalman filter or the FFT, constructs such as wavelets and public key cryptography, than the heroics and virtuosity surrounding the four-color problem, Fermat’s last theorem, or the Poincaré and Riemann conjectures. I tend to agree. Never having been much of a prodigy myself, I’ve always preferred thinking of math as a language for understanding the universe, rather than a list of famous problems to challenge heroes, an intellectual version of the Twelve Labors of Hercules. But for me the universe includes very abstract concepts, so I feel "pure" math such as category theory can be a great addition to the vocabulary of any scientist. I’d like human-originating intelligent life in the Solar System to survive, thrive, and not lose its values in the process. And I still think the best means is self-improving AI. I bet a lot of our readers would happily agree with your first sentence. It sounds warm and fuzzy. But a lot of them might recoil from the next sentence. "So we should build robots that take over the world???" Clearly there’s a long train of thought lurking here. Could you sketch how it goes? EY: Well, there’s a number of different avenues from which to approach that question. I think I’d like to start off with a quick remark—do feel free to ask me to expand on it—that if you want to bring order to chaos, you have to go where the chaos is. In the early twenty-first century the chief repository of scientific chaos is Artificial Intelligence. Human beings have this incredibly powerful ability that took us from running over the savanna hitting things with clubs to making spaceships and nuclear weapons, and if you try to make a computer do the same thing, you can’t because modern science does not understand how this ability works. At the same time, the parts we do understand, such as that human intelligence is almost certainly running on top of neurons firing, suggest very strongly that human intelligence is not the limit of the possible. Neurons fire at, say, 200 hertz top speed; transmit signals at 150 meters/second top speed; and even in the realm of heat dissipation (where neurons still have transistors beat cold) a synaptic firing still dissipates around a million times as much heat as the thermodynamic limit for a one-bit irreversible operation at 300 Kelvin. So without shrinking the brain, cooling the brain, or invoking things like reversible computing, it ought to be physically possible to build a mind that works at least a million times faster than a human one, at which rate a subjective year would pass for every 31 sidereal seconds, and all the time from Ancient Greece up until now would pass in less than a day. This is talking about hardware because the hardware of the brain is a lot easier to understand, but software is probably a lot more important; and in the area of software, we have no reason to believe that evolution came up with the optimal design for a general intelligence, starting from incremental modification of chimpanzees, on its first try. People say things like "intelligence is no match for a gun" and they’re thinking like guns grew on trees, or they say "intelligence isn’t as important as social skills" like social skills are implemented in the liver instead of the brain. Talking about smarter-than-human intelligence is talking about doing a better version of that stuff humanity has been doing over the last hundred thousand years. If you want to accomplish large amounts of good you have to look at things which can make large differences. (if I prove P then it is true) then you can use this theorem to prove P. Right now I don’t know how you could even have a self-modifying AI that didn’t look itself over and say, "I can’t trust anything this system proves to actually be true, I had better delete it". This is the class of problems I’m currently working on—reflectively consistent decision theory suitable for self-modifying AI. A solution to this problem would let us build a self-improving AI and know that it was going to keep whatever utility function it started with. There’s a huge space of possibilities for possible minds; people makethe mistake of asking "What will AIs do?" like AIs were the Tribe that Lives Across the Water, foreigners all of one kind from the same country. A better way of looking at it would be to visualize a gigantic space of possible minds and all human minds fitting into one tiny little dot inside the space. We want to understand intelligence well enough to reach into that gigantic space outside and pull out one of the rare possibilities that would be, from our perspective, a good idea to build. If you want to maximize your marginal expected utility you have to maximize on your choice of problem over the combination of high impact, high variance, possible points of leverage, and few other people working on it. The problem of stable goal systems in self-improving Artificial Intelligence has no realistic competitors under any three of these criteria, let alone all four. That gives you rather a lot of possible points for followup questions so I’ll stop there. JB: Sure, there are so many followup questions that this interview should be formatted as a tree with lots of branches instead of in a linear format. But until we can easily spin off copies of ourselves I’m afraid that would be too much work. So, I’ll start with a quick point of clarification. You say "if you want to bring order to chaos, you have to go where the chaos is." I guess that at one level you’re just saying that if we want to make a lot of progress in understanding the universe, we have to tackle questions that we’re really far from understanding—like how intelligence works. And we can say this in a fancier way, too. If we wants models of reality that reduce the entropy of our probabilistic predictions (there’s a concept of entropy for probability distributions, which is big when the probability distribution is very smeared out), then we have to find subjects where our predictions have a lot of entropy. Richard Hamming used to go around annoying his colleagues at Bell Labs by asking them what were the important problems in their field, and then, after they answered, he would ask why they weren’t working on them. Now, everyone wants to work on "important problems", so why areso few people working on important problems? And the obvious answer is that working on the important problems doesn’t get you an 80% probability of getting one more publication in the next three months. And most decision algorithms will eliminate options like that before they’re even considered. The question will just be phrased as, "Of the things that will reliably keep me on my career track and not embarrass me, which is most important?" And to be fair, the system is not at all set up to support people who want to work on high-risk problems. It’s not even set up to socially support people who want to work on high-risk problems. In Silicon Valley a failed entrepreneur still gets plenty of respect, which Paul Graham thinks is one of the primary reasons why Silicon Valley produces a lot of entrepreneurs and other places don’t. Robin Hanson is a truly excellent cynical economist and one of his more cynical suggestions is that the function of academia is best regarded as the production of prestige, with the production of knowledge being something of a byproduct. I can’t do justice to his development of that thesis in a few words (keywords: hanson academia prestige) but the key point I want to take away is that if you work on a famous problem that lots of other people are working on, your marginal contribution to human knowledge may be small, but you’ll get to affiliate with all the other prestigious people working on it. And these are all factors which contribute to academia, metaphorically speaking, looking for its keys under the lamppost where the light is better, rather than near the car where it lost them. Because on a sheer gut level, the really important problems are often scary. There’s a sense of confusion and despair, and if you affiliate yourself with the field, that scent will rub off on you. But if you try to bring order to an absence of chaos—to some field where things are already in nice, neat order and there is no sense of confusion and despair—well, the results are often well described in a little document you may have heard of called the Crackpot Index. Not that this is the only thing crackpot high-scorers are doing wrong, but the point stands, you can’t revolutionize the atomic theory of chemistry because there isn’t anything wrong with it. We can’t all be doing basic science, but people who see scary, unknown, confusing problems that no one else seems to want to go near and think "I wouldn’t want to work on that!" have got their priorities exactly backward. If Prof. A can understand Prof. B’s work, but Prof. B can’t understand Prof. A, then Prof. A must be smarter—so Prof. A wins. But I’ve figured out a way to game the system. If I write in a way that few people can understand, everyone will think I’m smarter than I actually am! Of course I need someone to understand my work, or I’ll be considered a crackpot. But I’ll shroud my work in jargon and avoid giving away my key insights in plain language, so only very smart, prestigious colleagues can understand it. On the other hand, tenure offers immense opportunities for risky and exciting pursuits if one is brave enough to seize them. And there are plenty of folks who do. After all, lots of academics are self-motivated, strong-willed rebels. This has been on my mind lately since I’m trying to switch from pure math to something quite different. I’m not sure what, exactly. And indeed that’s why I’m interviewing you! You are currently browsing the archives for the this week’s finds category.